Context: Early detection of predictors of adverse outcome will be helpful for neonatologists to plan management, follow up and rehabilitation in advance so that neurological disability can be minimised. Aims: The purpose of this study was to determine the factors affecting the adverse outcome of neonatal seizures. Settings and Design: This is a prospective study conducted in the neonatal unit of a tertiary care hospital. One hundred and eight newborns consecutively admitted with seizures were included in this study. Materials and Methods: Data was collected regarding perinatal history and seizure and evaluated for etiology. We conducted a retrospective analysis to identify the factors associated with adverse outcome after neonatal seizures. Statistical Analysis Used: Chi-square test with degree of freedom = 1 was used to find the variables significantly associated with adverse outcome (P < 0.05). Results: Gestational age, birth weight, Apgar score at 5 min, seizure onset <24 hrs, status epilepticus, radiological findings and EEG findings were significantly associated with outcome. 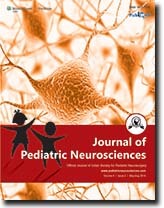 Conclusion: Mortality and severe neurological impairment after neonatal seizure is associated with prematurity, LBW, low Apgar score at 5 min, etiologies like meningitis, sepsis, severe HIE, brain malformations, grade 3 or 4 IVH or intracranial haemorrhage, seizure onset <24 hours, presence of status epilepticus, severely abnormal radiological and EEG findings. Objectives: The numerous antiepileptic drug (AED) withdrawal studies published in the last 40 years have relied mainly on heterogeneous study groups. There is still no general agreement on the criteria to predict safe discontinuation. The goal of this study was to assess the outcome of AED withdrawal in epileptic children. Materials and Methods: Three hundred and eight children with epilepsy were enrolled, and these patients followed at least 1 year after drug withdrawal. Time to seizure relapse and predictive factors were analyzed by survival methods. Results: Among the 308 patients, 179 (58.1%) were boys and 129 (41.9%) were girls and the mean age at the seizure onset was 60.41 ± 36.54 months (2-144 months). The recurrence occurred in 73 (23.7%) patients. Mental retardation, history of febrile seizure, etiological of epilepsy, abnormal first electroencephalogram (EEG), abnormal neuroimaging findings, and total number of AED before remission were significantly associated with relapse risk according to univariate analysis. In the multivariate analysis, abnormal first EEG and number of AED before remission (polytherapy) were the risk factors influencing seizure recurrence. Conclusions: In our study, recurrence rate was 23.7% in children and most occurred during the 1 st year. The potential risk factors of recurrence are history of febrile seizure, mental retardation, etiological of epilepsy, abnormal first EEG, abnormal neuroimaging findings, and total number of AED before remission. However, we found abnormal first EEG and polytherapy as risk factors of recurrence in multivariate analysis. Background: Electrical status epilepticus in slow wave sleep (ESES) is a rare, age-related, self-limited disorder characterized as epilepsy with different seizure types, neuropsychological impairment in the form of global or selective regression of cognitive functions, motor impairment, and typical electroencephalographic (EEG) findings of continuous epileptic activity occupying 85% of nonrapid eye movement sleep. Aims: The aim is to examine the clinical and electrophysiological findings and treatment modalities of children with ESES and to evaluate the outcome of the disorder. Materials and Methods: Fourteen patients with a diagnosis of electrical status epilepticus during slow wave sleep and followed-up at least 2 years were included. Statistical Analysis: Pearson correlation test was used in the study. Results: Among the 14 patients, eight of them had normal mental development before ESES. Twelve of the patients mentioned cognitive impairment and decline in school performance during ESES. After ESES, seven patients had mental retardation in different severity. One of these patients was diagnosed with benign partial epilepsy of childhood with centrotemporal spikes and had normal intelligence quotient level prior to ESES. The diagnosis of ESES was made after newly occurred different seizure types in four of the patients while two of the previously known epileptic patients presented with only severe psychiatric impairment. Valproic acid and carbamazepine were the mostly frequently used drugs before the onset of ESES. After at least 2 years of follow-up, seven patients were seizure free, but still taking antiepileptic treatment. Five patients were seizure free, while two of them had ongoing seizures despite antiepileptic therapy. Conclusion: ESES should be kept in mind in children with unexplained regression or stagnation of development associated with seizures or not. Sleep EEGs should be performed for timely diagnosis, proper treatment and prevention of permanent cognitive impairment. Background: Simple febrile convulsion is the most common disease of the nervous system in children. There are hypotheses that iron deficiency may affect febrile convulsion and the threshold of neuron excitation. Aims: This study was conducted with the objective of finding the effects of iron deficiency anemia on simple febrile convulsion episodes. Settings and Design: The study was conducted at AmirKabir Hospital of Arak Medical Sciences University, Arak, Iran. This is a case-control study. Materials and Methods: In this study, 382 children who were selected according to our inclusion and exclusion factors, were divided into two groups of case (febrile convulsion) and control (other factors causing fever) by their cause of hospitalization. After fever subsided, 5 ml blood sample was taken from each child and complete blood count and iron profile tests were performed. Statistical Analysis: The results were interpreted using descriptive statistics and independent t-test. Results: The prevalence of anemia in the group with febrile convulsion was significantly less than that in the control group: 22.5% of the children in the group with febrile convulsion and 34% in the control group exhibited anemia (P < 0.001). Moreover, the group with febrile convulsion had significantly higher blood indices, such as Hb, Hct, MCV, MCH, and MCHC, compared to the control group (P < 0.001). Conclusions: Iron deficiency can prevent febrile convulsion in children and probably increases the threshold of neuron excitation in fever. Background: Now-a-days, children are exposed to mobile phone radiation at a very early age. We have previously shown that a large proportion of children in the city of Shiraz, Iran use mobile phones. Furthermore, we have indicated that the visual reaction time (VRT) of university students was significantly affected by a 10 min real/sham exposure to electromagnetic fields emitted by mobile phone. We found that these exposures decreased the reaction time which might lead to a better response to different hazards. We have also revealed that occupational exposures to radar radiations decreased the reaction time in radar workers. The purpose of this study was to investigate whether short-term exposure of elementary school students to radiofrequency (RF) radiation leads to changes in their reaction time and short-term memory. Materials and Methods: A total of 60 elementary school children ages ranging from 8 to 10 years studying at a public elementary school in Shiraz, Iran were enrolled in this study. Standardized computer-based tests of VRT and short-term memory (modified for children) were administered. The students were asked to perform some preliminary tests for orientation with the VRT test. After orientation, to reduce the random variation of measurements, each test was repeated ten times in both real and sham exposure phases. 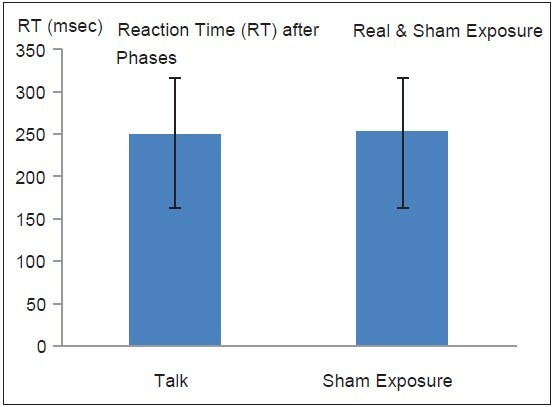 The time interval between the two subsequent sham and real exposure phases was 30 min. Results: The mean ± standard deviation reaction times after a 10 min talk period and after a 10 min sham exposure (switched off mobile) period were 249.0 ± 82.3 ms and 252.9 ± 68.2 ms (P = 0.629), respectively. On the other hand, the mean short-term memory scores after the talk and sham exposure periods were 1062.60 ± 305.39, and 1003.84 ± 339.68 (P = 0.030), respectively. Conclusion: To the best of our knowledge, this is the first study to show that short-term exposure of elementary school students to RF radiation leads to the better performance of their short-term memory. Trigonocephaly is the premature fusion of the metopic suture leading to deformation of anterior calvarium causing keel shaped deformity of forehead. In most cases, surgical correction is for aesthetic and psychosocial reasons. Various techniques have been described. Here we describe a technique, which is simple to perform with good postoperative results. Metopic suture is excised, one side is reconstructed in finger clasping manner to fit in an expanded area, and the other side is transected and simply molded, and all these fixed with nonabsorbable suture. Supraorbital horizontal bar is mobilized on either side anteriorly and fixed with titanium plate and screws. Benign enlargement of sub-arachnoid spaces (BESS) is one of the causes of macrocephaly in infants. It is a self-limiting condition and does not require any active medical or surgical treatment. We report a case of an infant aged 4 months who was referred for magnetic resonance imaging (MRI) of the brain as the head circumference of the infant had increased rapidly from the 50 th percentile in the 3 rd month to more than the 95 th percentile in the 4 th month of age. MRI revealed enlarged anterior sub-arachnoid spaces and mild prominence of all the ventricles. A possibility of BESS was suspected since the child was neurodevelopmentally normal. A follow-up MRI done at the age of 18 months showed a reduction in the size of the sub-arachnoid spaces with normal sized ventricles. Ventriculoperitoneal (VP) shunt malfunction commonly presents as raised intracranial pressure. Rarely, when the central canal of the spinal cord communicates with the 4 th ventricle, shunt malfunction can present as an expanding syrinx. The diagnosis is often delayed, resulting in severe morbidity. Some of these patients undergo repeated syrinx surgeries without much benefits. We report a case of chronic tuberculous meningitis with shunt malfunction presenting as an expanding spinal canal syrinx and quadriparesis. Fourth ventricular communication with syrinx was demonstrated with the help of a contrast ventriculogram. After shunt revision, syrinx resolved completely and the patient made significant improvement in his neurological deficits. The present case illustrates that a historical and rarely used investigation like contrast ventriculogram aids in the diagnosis and management even in the current neurosurgical practice. All patients with late onset syrinx and a previous VP shunt need to be investigated for shunt malfunction before considering syrinx surgery. 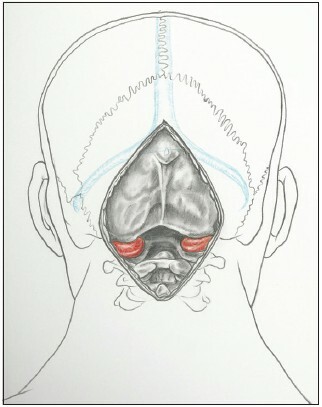 A simple shunt revision resolves the syrinx in such conditions and avoids more complex procedures like Foramen magnum decompression. Relevant literature has been reviewed; pathophysiology and management options have been discussed. An encephalocele is a developmental disorder of neural tube closure, where as schizencephaly is a developmental disorder of neuronal migration. There are only few case reports suggesting association of schizencephaly with meningoencephalocele. 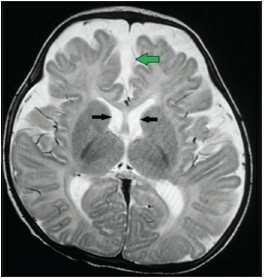 We report a case of 6-year-old child who was brought by her parent with complaints of progressive swelling over her vertex since birth, left sided hemiparesis and intermittent generalized tonic clonic convulsion for last 3 years. 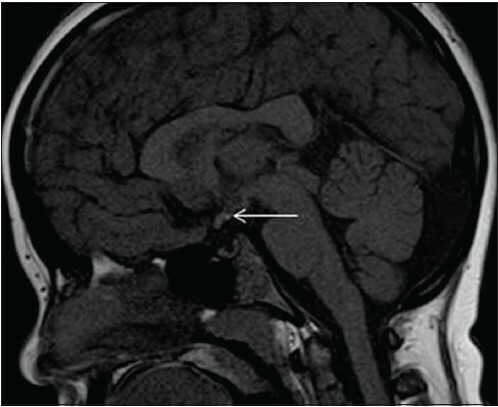 Clinical examination, computed tomography (CT) and magnetic resonance imaging (MRI) of brain revealed a large calvarial defect with meningoencephalocele and associated schizencephaly. 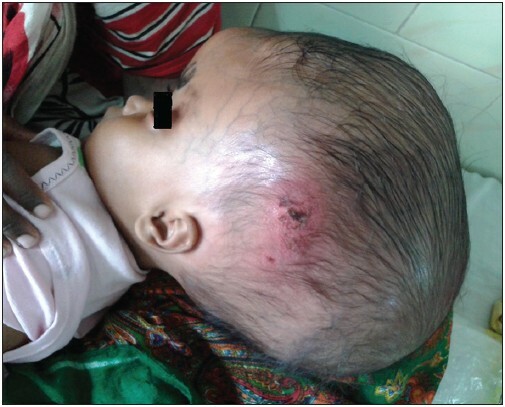 Initially, ventriculoperitoneal (VP) shunt was carried out, followed by successful repairing of the defect. This case is interesting for late presentation, management difficulties and associated anomalies "schizencephaly", which is a rare developmental disorder. 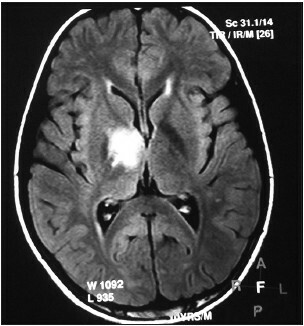 A case of intradiploic arachnoid cyst is reported. 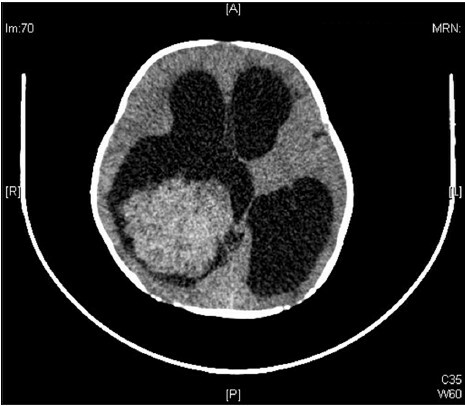 The patient presented with a progressively enlarging swelling situated over left frontal region for approximately 13-years following blunt trauma to head. Magnetic resonance imaging showed an intradiploic fluid containing cyst having intensity like cerebrospinal fluid (CSF). He underwent craniotomy and successful surgical repair. Intraoperatively CSF cyst was located in the frontal pole with a large defect over inner table and large rent in the dura. It was lined with arachnoid membrane. Pertinent literature is reviewed in brief. Guillain-Barre' syndrome is a rare complication of typhoid fever, and only a few such cases have been reported in the pediatric age group. 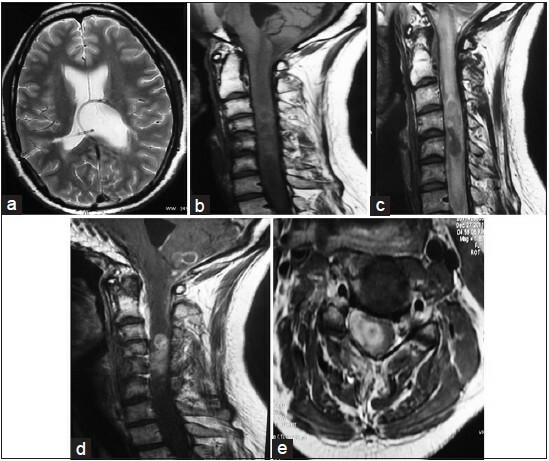 We report a young boy with blood culture proven typhoid fever that developed this very rare neurological complication quite early in the course of the disease. Following treatment with intravenous antibiotics and intravenous immunoglobulin, he improved. Acquired human immunodeficiency virus (HIV) infection in a 10-year-old child, presenting with monoparesis, progressing to triplegia over 4 weeks is an extremely rare feature. The child had left upper motor neurone facial palsy with left hemiplegia, paralyzed right lower limb, grade zero power, exaggerated deep tendon reflexes and bilateral extensor plantars. Child tested positive for HIV by ELISA. CD3 + absolute count was 431. CD3 + CD4 count was 28, and CD45 absolute count was 478. Magnetic resonance imaging of brain and spine showed multiple ill-defined foci of hyperintensity in white matter suggestive of ADEM. Acute demyelinating encephalomyelitis (ADEM) is an extremely rare presenting feature of perinatally acquired HIV infection in paediatrics. Clinically child remained same even with methylprednisolone, intravenous immunoglobulin, antituberculosis therapy, trimethoprim-sulfamethoxazole prophylaxis and supportive therapy. Child had sudden clinical deterioration and death before antiretroviral therapy could be initiated. This case emphasizes that pediatricians and neurophysicians should suspect HIV as an etiology of ADEM in cases with atypical clinical presentation and social risk factors, in spite of its very rare occurrence. Fucosidosis is a rare lysosomal storage disorder due to deficiency of fucosidase enzyme, with around 100 cases reported worldwide. Here, we describe the clinical and imaging features in two siblings with fucosidosis. 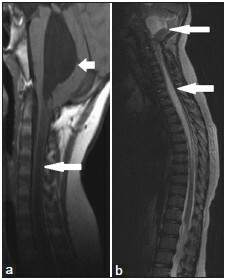 An 8-year-old girl presented with global developmental delay, followed by regression of acquired milestones from 3 years of age with bipyramidal, extrapyramidal involvement, coarse facies, telangiectatic lesions, dysostosis multiplex, characteristic magnetic resonance imaging finding along with undetectable levels of the fucosidase activity, which confirmed the diagnosis. Younger sibling has mild developmental delay with autistic traits with no neuroregression until now. He also has undetectable level of fucosidase enzyme activity and is being considered for stem cell transplantation. New case reports would expand the clinical spectrum, early diagnosis and help formulating appropriate therapy. Early diagnosis is crucial and hence sibling screening can be done, and those in the presymptomatic stage can undergo hematopoietic stem cell transplantation, which is potentially curable. 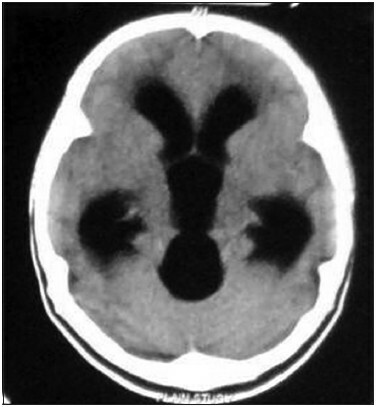 Intracerebral abscess are rare in neonates and infants. 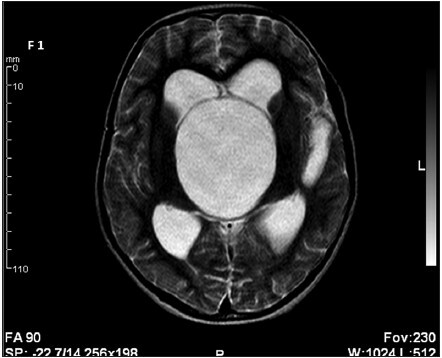 We present a rare case of 4-month-old immunocompetent infant with multiple intracranial fungal abscess. Right frontoparietal craniotomy was done with excision of multicystic mass containing 200cc of dirty colored fluid. Biopsy and culture of abscess came as Aspergillus fumigates. Patient received parental amphotericin B. 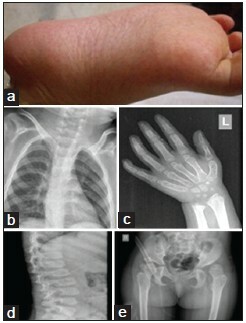 An immunocompetent infant with intracranial aspergillosis is rare. We advocate combination of surgical excision with parental amphotericin B as best way to achieve good result. Extradural hematoma (EDH) after ventriculoperitoneal (VP) shunt procedure is a rare, dangerous but easily avoidable and manageable complication. It is more common in children and young adults presumably due to relatively lax adhesion of dura to calvarium. We report a case of an 18-year-old male with acqueductal stenosis who underwent VP shunt procedure. 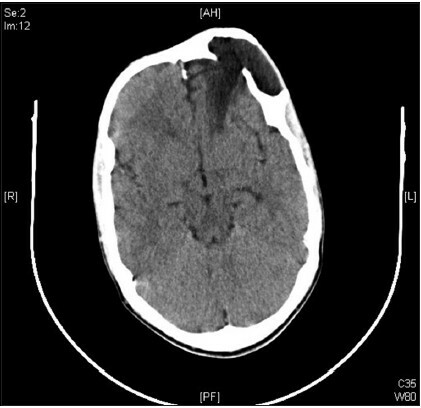 Three months later, a computed tomography (CT) scan was done for the complaints of intractable headache and altered sensorium which showed chronic calcified EDH near shunt site. The ventricular catheter was in position and the ventricles were decompressed. After surgical decompression of EDH his symptoms improved. We discuss the factors leading to formation of EDH, with stress on proper technique to prevent or minimize such an avoidable complication. Traumatic brain injury is a leading cause of morbidity and death in the pediatric population. In this study, we report a delayed unilateral traumatic brain swelling in a child with initial favorable evolution and sudden neurological deterioration after 4 days; highlighting clinical, physiopathological and radiological aspects of delayed unilateral brain swelling. We report a 13-year-old female patient having vertigo and visual blurring since 2 weeks with blood pressure being 180/106 mmHg. 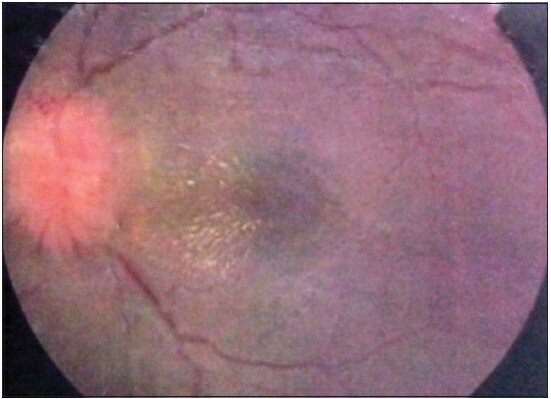 Fundus examination showed optic disc edema with macular star. After ruling out infective causes, idiopathic neuroretinitis was diagnosed. 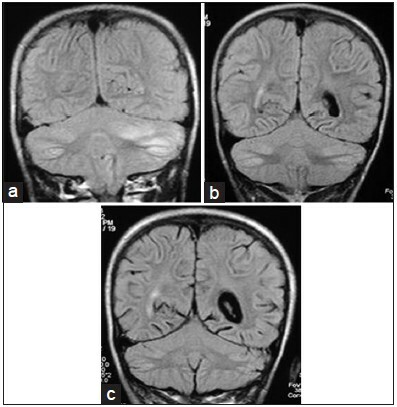 Her brain magnetic resonance imaging (MRI) scan revealed three periventricular morphologically multiple sclerosis (MS)-like white matter lesions. Renal ultrasound and renal arteriogram showed a shrunken left kidney, small non-stenotic left renal artery and reduced vessels in upper pole of left kidney, consistent with Ask-Upmark kidney (AUK). Her symptoms improved with antihypertensive drugs. Follow-up MRI at 1 year revealed no interval change, while fundus had normalized. Neuroretinitis typically has normal brain MRI and rules out MS. However, our patient having AUK-induced hypertension had neuroretinitis and MS-like brain lesions and did not fulfill diagnostic criteria for MS. Thus we postulate that MS-like lesions can be part of neuroretinitis, especially in hypertensive patients. Bobble - head syndrome (BHDS) is a complex and rare syndrome with repetitive anteroposterior head movements. It is usually associated with expansile lesions in the third ventricular region. We present a 9 year old child with a giant suprasellar arachnoid cyst causing involuntary head movements. Choroid plexus papillomas (CPPs) are rare tumors having bimodal distribution. Pediatric CPPs are commonly present in supratentorial compartment and most commonly located in lateral ventricle and usually present at 16-18 months. 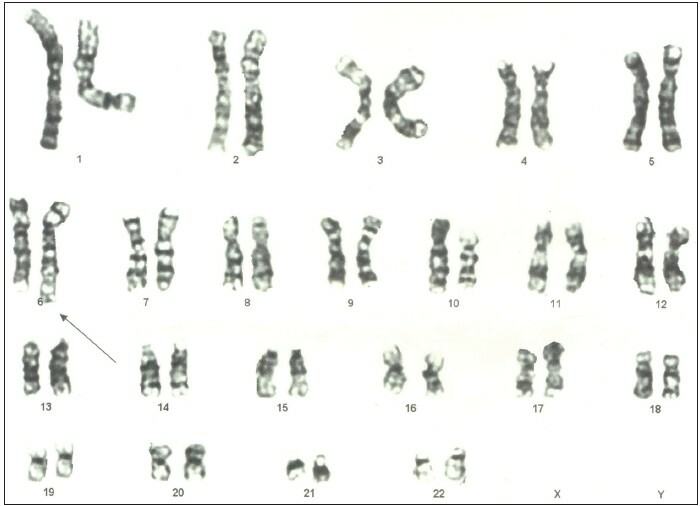 Authors could find only one case report of fetal choroid plexus papilloma in the literature. 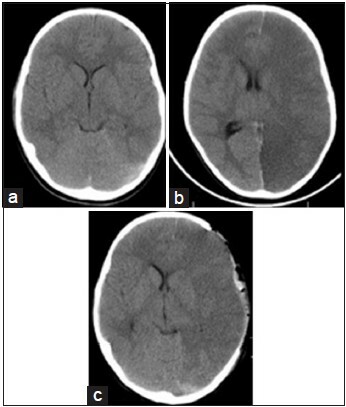 In the present case, authors illustrate an unusual presentation of CPP with raised intracranial pressure (ICP) since birth, the need for proper preoperative planning, meticulous surgical technique, and intensive intra operative monitoring for normothermia, fluid-electrolyte balance, and blood replacement for achieving excellent results. Pickardt syndrome (Pickardt-Fahlbusch syndrome) is a rare congenital syndrome characterized by tertiary hypothyroidism caused by the interruption of the portal veins between hypothalamus and adenohypophysis. Typical features of this syndrome are tertiary hypothyroidism with low thyroid stimulating hormone, hyperprolactinemia and other pituitary hormone deficiencies. Pituitary stalk interruption syndrome is characterized by a triad of thin or interrupted pituitary stalk, aplasia or hypoplasia of the anterior pituitary and absent or ectopic posterior pituitary (EPP) seen on magnetic resonance imaging (MRI). It is a congenital anomaly of pituitary whose exact prevalence is unknown. In some cases, it is restricted to EPP or pituitary stalk interruption. We are presenting the case history along with MRI finding of three children's who presented with short stature and delayed puberty. Ventriculo-peritoneal (V-P) shunting is an accepted procedure before a direct approach to large tumors producing obstructive hydrocephalus. However, it has been associated with some complications. Intratumoral hemorrhage is an uncommon but fatal complication of V-P shunt insertion. The exact mechanism of this complication is unknown, but several mechanisms have been proposed including rapid lowering of intracranial pressure following V-P shunt placement or cerebrospinal fluid (CSF) drainage and sudden decrease in CSF volume and pressure after V-P shunting. We report an 8-year-old girl who presented with severe headache, double vision, and bilateral papilledema. 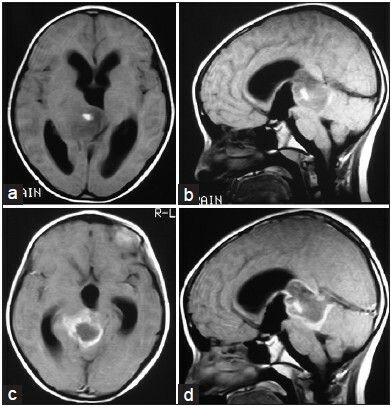 Brain magnetic resonance imaging with and without gadolinium administration revealed a large tectal plate tumor compressing the aqueduct which caused hydrocephalus. Due to progressive decline in consciousness level, an emergency CSF diversion was planned and she underwent left side posterior parietal V-P shunt placement. Eight hours after V-P shunt insertion, she suddenly developed tonic-clonic seizures and collapsed into deep coma with dilated pupils and stopped breathing and died 1-day later. Histological examination of the autopsy specimen showed the tumor was a glioblastoma multiforme with massive intratumoral hemorrhage. The possible pathophysiological mechanisms of this fatal complication are discussed here and the pertinent literature is reviewed. It seems that endoscopic third ventriculostomy is the procedure of choice for CSF diversion in patients with tectal plate gliomas and decreases the occurrence of intratumoral hemorrhage. 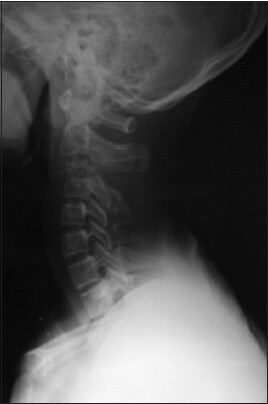 Aneurysmal bone cysts (ABCs) of the cervical spine are rare occurrences accounting for about 2% of all cases. Having a propensity to develop in the pediatric population, it generally involves the posterior elements with occasional extension to the facets and body of one vertebral level. Surgical treatment of high cervical ABC in pediatric patients is challenging. Where as complete tumor resection should be attempted for the best chance for cure, spinal fusion should be added to correct the defects created by resection to minimize the risk of postoperative instability. 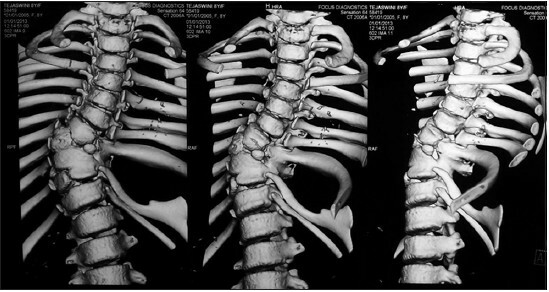 This paper presents a multi-level giant expansile ABC of the high cervical spine involving all three spinal columns in a 13-year-old girl and discuss the surgical management. Surgical treatment in this patient included complete tumor excision and circumferential fusion in two stages without any neurovascular injury. The safety and efficacy of this method, especially in the pediatric population is discussed in view of pertinent literature.